Looking for the best outdoor solar lights that will reward you every night by coming on automatically as the sun sets and keep shining for many hours without any effort or on going costs? You can place them anywhere there is direct sunlight because there is no need for a cord or electricity. Solar outdoor lights work by collecting sunlight through the solar panel that sits on top of the rock. The solar power is converted to electrical power which is stored in the rechargeable battery. The wonderful light sensing technology just knows when it is getting dark and automatically turns on in the evening. If you place the light near another light source, such as a porch light or entry light, it will not sense darkness and will not turn on. Outdoor solar lights are the most rewarding of all pool party lights. No need for batteries, no electric cords, and no candles that blow out. 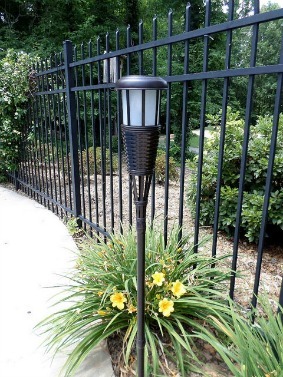 These landscaping lights come in a variety of forms from torches to rocks to pathway lights. We have many different solar lights that serve different purposes depending on where they are placed. I like a bright white light with lots of LEDs to light up the path to the pool, but a soft, flickering light for the solar torches. A solar tiki torch provides lots of the same features as tiki torches, except that they come on automatically every night. No need to go around and light them. I bought two sets of 4 solar tiki torches from Amazon because I love how they come on in the evening while we are sitting out at the pool enjoying an evening dinner. They are placed all around the perimeter of the pool. No getting up to fill canisters with oil and running around with a lighter to light them. They are easy to set up - just place them in a sunny spot. Ours get 6-8 hours of sunlight each day. The height can be adjusted by using more or less of the pole pieces. I got this set of 4 dark chocolate lights from Amazon for less than $55. The flickering light gives it a touch of a real tiki torch without the hassle. 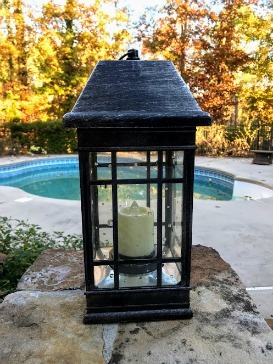 We bought a set of 4 of theses flickering solar lights and liked them so much we bought another set to line the path to our pool. When fully charged, at lest 5 hours of direct sunlight, the flickering flame will stay lit for up to 10 hours. We love the convenience of our solar powered path lights. 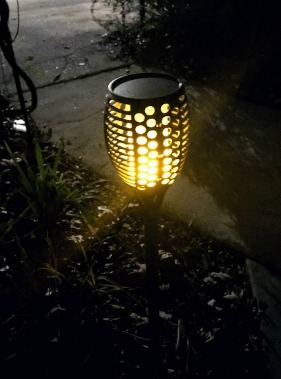 This one in particular is different from other solar path lights - it has 6 bright LEDs which actually light up the path - much brighter than other solar path lights. They look good during the day - actually quite elegant - made of steel and real glass - no plastic. Of course they automatically come on at dusk. Often they are still glowing when I get up in the morning. I kept looking for high quality lights that were brighter than what can be found in a home improvement store. This set of 4 lights costs $99 from Amazon - so they cost more than others - but rarely do you see 5 star ratings by almost 23 reviewers. At first I bought only one set, but after seeing how nice they look and how well they light up our path, I quickly ordered a second set. I found what I was looking for. My favorite finish is the bronze. Floating solar pool lights are becoming more popular and finally the prices are dropping. Instead of almost $100 for one orb you can now get one for a little over $30. This solar floating orb is about the size of a volley ball and has 5 different color modes. The color modes are white, red, blue, green and one that cyles through all the colors. I like that you can actually pick what color you want and keep it there. When fully charged it can go about 6 hours at night. It is completely waterproof but can be used outside the pool as well. Since it is slightly flat and weighted on the bottom, you can place it on the ground near the party area. What we love about our globe solar lights is that you can put them anywhere you get several hours of sun without needing any electric cord to power them. The bulbs are bright and provide wonderful evening light that comes on automatically when the sun goes down. We have several sets of solar string lights that we keep out all year round. One set is wrapped around a small deck and railing that overlooks the pool. Another set is on the garden arbor on the sidewalk going to the swimming pool. 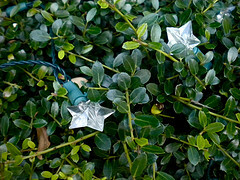 We also have placed them on bushes and strung them in small trees just like one would string Christmas lights. We love how they just automatically come on at dusk. But we especially like the solar LED string lights. You know what a pain it is to work with strings of outdoor Christmas lights - even though the box says that the string of lights will continue to work, even when one bulb goes out - you also know not to believe that ...right?! That's what makes LED lights so great - the bulbs never burn out - or only after like 10,000 hours. The solar lights on the bushes that are closer to the pool actually are reflected in the pool for a double delight. We purchased several sets of these solar LED string lights from Amazon. They come as either as a set of two 200 string lights or as a single string. Just when you thing your outdoor solar lights are not as bright as they used to be or provide no light at all you may need to replace the batteries. Solar light batteries will last anywhere from one season to several seasons. Often there is no need to replace your solar garden lights when all that is needed is new rechargeable batteries. Several of these solar lanterns light up our stairs. They are very elegant with clear glass and a bronze finish. A warm light makes them very attractive and the solar panel means they just come on automaticaly every evening and stay lit till the early morning. It's recommended that you fully charge the lantern before turning the switch to "on." Don't place them near your flood lights or entry light as other light sources will interfere with the sensor and they won't come on. Get a set of two to place around or near your pool or patio area. 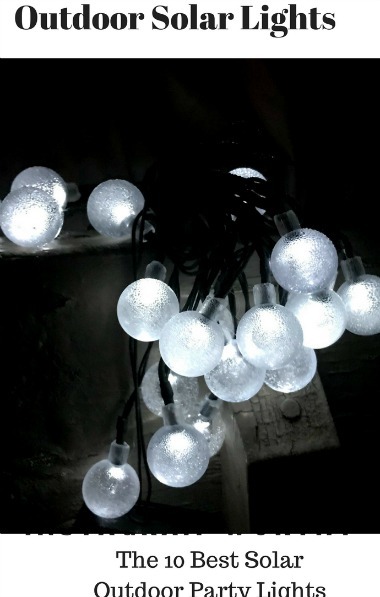 Solar string lights come in a variety of styles and shapes. 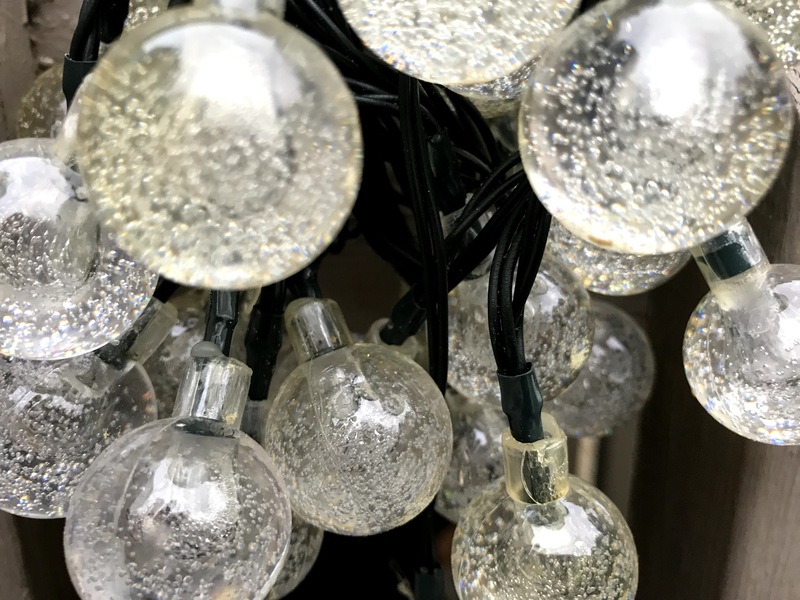 What I like about the star string lights is that the star shaped light is larger than a regular LED light and therefore provides more light and more impact than regular lights. We have several solar spot lights shining on trees in three three corners of our backyard pool. We have neighbors who have just put in a pool with electric spot lights on their trees and ours are just as bright - and a lot less expensive. They come on consistently every night, the light is nice and bright and there is no need for any electrical wiring. What could be more simple than that? When the batteries need replacing they are located under the solar panel. 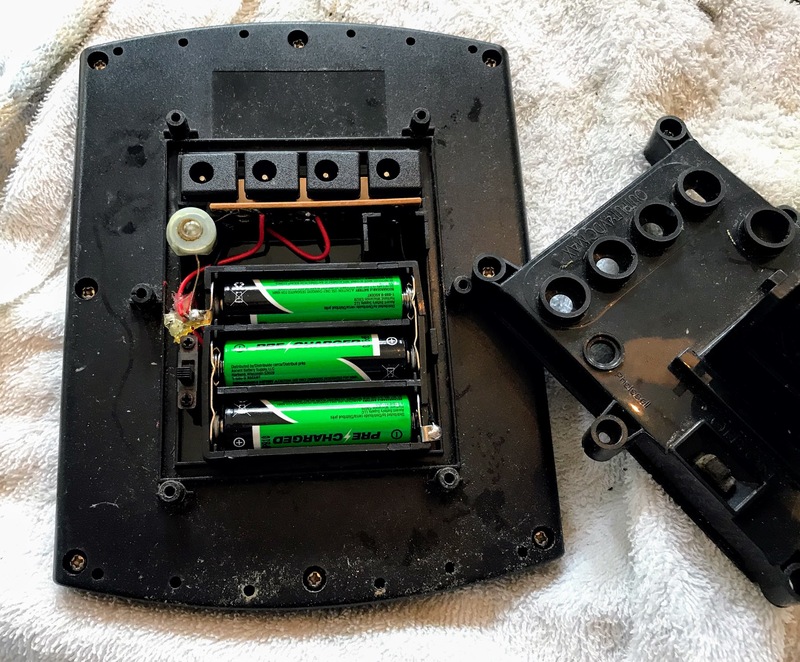 Unscrew the screws to open the battery panel and replace the old batteries with new rechargeable batteries. We use our solar rock light as a spotlight to light up a bird bath. 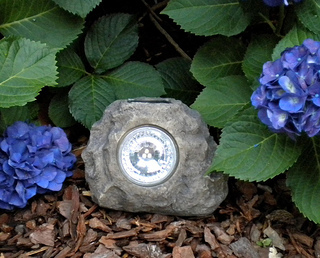 Solar rocks are a great for providing spot lighting, especially to dark corners or areas where there is no light. These solar outdoor lights can be found at just about any home improvement store in the spring and summer and at Bed, Bath and Beyond. They are inexpensive - just over $10. Ours lasted about 2 seasons and then needed to be replaced. They come on every night and are often still lit when we get up in the morning. You can expect around 8 hours if the rock is fully charged. Which means the rock needs to be placed in a sunny spot where it can get sunlight most of the day. The more light it gets the stronger the charge and the longer the rock will stay illuminated. Enjoying your pool in the evening is just as fun as it is during the day and sometimes even better because of the cooler temps. There are lots of ways to light up your evening. 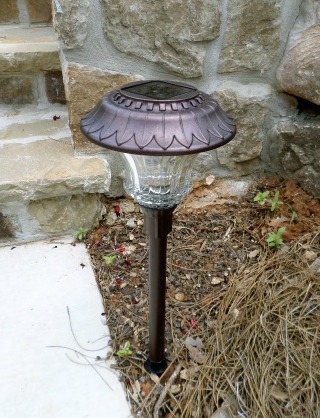 Solar umbrella lights provide an enjoyable ambiance that can be appreciated every night. No batteries, no electric cords, no turning lights on or off - so easy. No need to leave your guests or a good time in the pool to go around and light tiki torches or turn on battery operated lights. We love the simplicity and the ambience that solar lights provide. Use different outdoor solar lights for different areas around your swimming pool - whether you string them in trees, place them along a path or surround the perimeter of the pool deck - you will love the simplicity, the low cost and light to brighten any evening out by the pool.